*Special thanks to National Park Service volunteers Peg and Rex Lavoie for providing all the photographs that illustrate this week’s National Park Getaway. As it rises over the Sierra Ancha Mountains, the sun begins to illuminate several caves near the historic Apache Trail. Between these great gaps in stone lie the relics of a once-vibrant Native American culture. Here at Tonto National Monument, you are propelled back over 700 years and invited to experience life as part of an ancient Salado society. Guests at the monument enjoy stunning views of Lake Roosevelt, named for Theodore Roosevelt, who created Tonto National Monument in 1907. Inside the prehistoric cave dwellings, you will discover the fingerprints of those who shaped this magnificent architecture long before modern America existed. In a testament to the precision and skill of these ancient architects, the bulk of the dwellings still stand, supported by the wood used by the original builders. Pottery shards and stone tools can be spotted throughout the caves, which are estimated to have been occupied by 60 to 100 people. Park rangers will teach you about the local ecosystem, which includes a plethora of wildlife and useful plants. Be sure to visit the monument this spring to witness some of the most magnificent wildflowers anywhere in the Southwest United States. These wildflowers add vibrant color to a landscape already rich in cacti such as the prickly pear, cholla, and the towering saguaro. Many of these useful plants helped to sustain the livelihood of the prehistoric Salado people. As part of the Sonoran Desert ecosystem, the monument is also the chosen habitat of many javelina, coyotes, and rare gila monsters. If you would prefer to escape the desert sun or monsoon rains, there is a museum within the visitor center providing exhibits of polychrome pottery and ancient clothing woven from yucca, agave, and cotton. You may come across a vivid rattlesnake display as well as prehistoric hunting tools and traps. In addition, a movie plays both in the museum and on the observation deck. Although by exploring the dwellings and museum you will become more familiar with the Salado people, mysteries remain. Not much is known about the Salado, and there are no written records except for sporadic petroglyphs dotting the Salt River. No one is certain why the Salado left only 150 years after assembling their lives inside these caves. To really experience this place, climb the self-guided trail to the lower cliff dwelling and reserve a spot on one of the ranger-guided upper cliff dwelling tours, which are conducted 3-4 times per week, November through April. 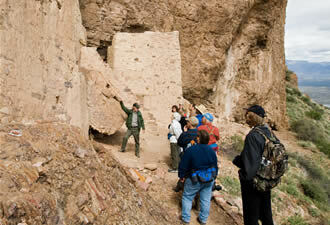 The Lower Cliff Dwelling Trail welcomes pets and closes to uphill travel at 4 p.m. Other exciting events throughout the spring season include full moon hikes, Heritage Days, photography tours, and Junior Ranger Day. Please visit our 2010 event schedule online for dates and times of these programs. Our visitor center is open every day, except December 25, from 8 a.m. to 5 p.m. Plan to stay the night? 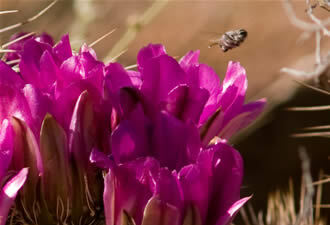 Camping is available at nearby Tonto National Forest, which is managed by the U.S. Forest Service. 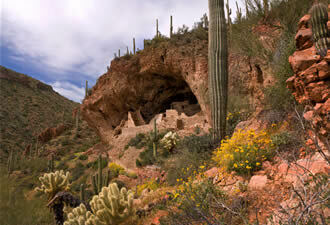 Each adult admission to Tonto National Monument is only $3, unless you have an America the Beautiful National Parks Pass. Children under 16 are always free.